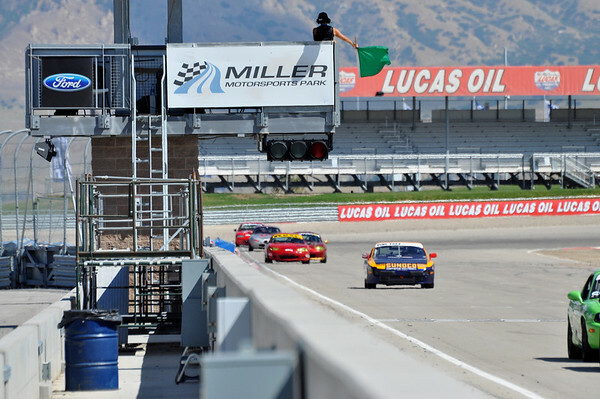 NASA’s 2013 944 Spec National Championships at Miller Motorsports Park was as much a family reunion as a racing event, with BBQ’s, Pizza parties, and a great time among friends. It was also a truly “National” Championship, with racers coming from as far East as Ohio, as far North as Washington, as far South as Texas, and as far West as California. Three former National Champions were present, and some of the fastest drivers from almost every region. The week’s races started off on Thursday with a surprise, as Neal Agran pulled out a win in his first race at the track, holding off two time defending Champion Tyler Palmer with a brilliant and flawless drive. A wild four-wide start up front helped mix up the grid, with Agran emerging in the lead from outside pole. 2009 Champion Charlie Buzzetti was deep in the mix, moving up to second, before Palmer got back by, leaving Buzzetti 3rd. The 2007 & 2008 Champion Eric Kuhns fell prey to the wily James Foxx on the last lap, finishing 5th, and 4th, respectively. The high-speed corners of Miller caught several drivers out further back, resulting in some wild video of spins and off-course excursions. Arizona regional director and 2008 Miller hotshoe, Norm Hamden, blew his new motor, but hung out to help several drivers with car setup and driver coaching in the finest 944 Spec tradition. As word got out that Thursday’s race winner was giving away his secrets and Traqmate data, several drivers availed themselves of Agran’s coaching and data interpretation services to very good effect. Jason Walsh and Sean Thul in particular gained a lot of time, and moved up to challenge the front-runners in Friday qualifying. Impressively, they went on to post lap times at or below National Champions’ efforts in previous years. This was shaping up to be a very competitive field! Only in 944 Spec will you see this level of generous sportsmanship among front-running racers. Friday’s race started with Palmer on pole again, with Buzzetti off pole, followed by Agran. This time, Palmer was not to be denied, stretching out a six second gap from the next pack of 2nd through fifth, which finished nose to tail following a full 25 minutes of intense, but entirely clean racing. Kuhns moved up early, passing Walsh and Pete Dimuzio before again being challenged by a late surge from Foxx, who posted some of the fastest times of the race in the closing laps. This time Kuhns successfully held off the cagey veteran to finish 4th. Meanwhile, Buzetti and Agran ran nose to tail the entire race. With nothing to gain in starting position by moving up to second, Agran wisely elected not to push the issue, but hoped for a mistake by Buzzetti, which was not to come. Buzzetti and Agran finished 2nd and 3rd, respectively. Midwest driver Sudhir Chikkarra was one of the stories of the week – overcoming great adversity, and ultimately receiving the hard-charger award. Shortly after arriving on the back of the Midwest’s region’s spectacular looking 53 foot long four car open trailer, he developed multiple failures that proved vexing to solve for the underlying problem. His woes included multiple failed distributor rotors, overheating, and a lifter rattle. With the tireless efforts of Jim and Kelby Hartman of Pine Tree Motorsports, and the overwhelming generosity of his fellow racers, the entire top end of his motor and radiator were ultimately replaced. When Sudhir set out to find a replacement head, he came back with three, such was the generosity of the 944 Spec family of racers. In the end, it was found that his cam tower had lost a chunk out of a lifter bore, which was a novel failure mode! After such exciting racing in the qualifying races, Saturday’s 45 minute Championship race dawned to great expectations -- and did not disappoint! Palmer was on pole, followed by Agran, Buzzetti, Foxx, and Kuhns in that order. Both Agran and Buzzetti were able to get by Palmer on the start, with Kuhns threatening down the inside, getting by Foxx in the first turn. Kuhns was subsequently bottled up in turn 5, falling back to 5th as Foxx and Dimuzio snuck by. More great racing ensued as Kuhns battled back to repass Foxx and Dimuzio in the next lap. Palmer patiently waited several laps before finding an opening to get by Buzzetti for 2nd, and setting his sights on Agran. Coming into turn 1 on lap 7, Palmer dove to the apex beside Agran, the two of them literally running door-handle to door handle through next two turns. Unbelievably, there is a smudge from Palmers’ door handle just below Agran’s, leaving the paint intact! I think this is the only time the phrase “that will buff right out” actually applies! 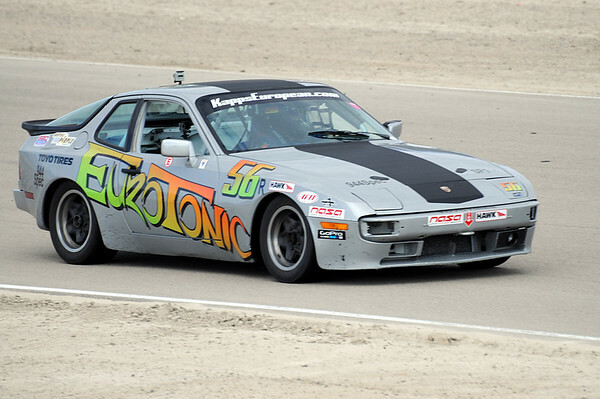 Absolute perfection in 944 Spec’s mantra of “clean, close racing” at the highest levels! Remember Chikkara and his engine woes? He remained positive and determined, and despite little time on this daunting, high speed track, gamely started from 21st place. He was able to use the coaching from Agran and sheer determination to move up 10 positions during the race, before finally finishing in 13th. He did all this while directly engaged with a determined Thomas Atteberry, and dodging pirouetting 944’s. Atteberry’s race video of this engagement with Chhikara has to be seen to be believed! Chikkara was a shoe–in for the hard charger award, winning a Magnum Tire gauge from Apex Performance that is the size of a Texas belt buckle! Foxx also created a great story in the Championship race. He developed a stumble and had to pit (much to the relief of Kuhns) after several laps. He was able to find a loose spark plug wire, and aided by a full course yellow, re-enter on the same lap, moving his way back up to 8th. Another incredible drive! Meanwhile, two full course yellows bunched up the field, and it was game on up front each time. Despite efforts by Agran, Buzzetti, and Kuhns to freight train by Palmer down the straight, Palmer executed flawless restarts, and the parity of the Spec motors was evident, as the others were unable to close the gap. Kuhns and Buzetti engaged in a last battle for third, with under/over moves, and side-by-side racing through several of the last corners. No 944’s were harmed in that crowd-pleasing adventure! In the end, Buzetti held on to the final podium spot and Kuhns settled for 4th and a clean, exciting race! Thul used the tips from Agran to push himself up to a remarkable 5th place, a result that surprised even himself. Palmer put on a clinic at the last restart and held on to take his 3rd National Championship by 1.5 seconds over another remarkable drive by the hard charging Agran, who moved himself up one spot on the podium from two years ago. A measure of the parity seen in the race was that the fastest lap times among the top 4 drivers was within 0.4 seconds, and the average dyno results of those cars was within 3HP (2%). Truly a driver’s Championship, as it should be in 944 Spec! Trying to get the car and trailer ready for my first ever trip to Mazda Raceway Laguna Seca. My normal routine is very hard to follow because of 113 degree heat! I can only pack up the trailer for 10 minutes at a time before sneaking back into the house to sit under an a.c. vent. I finally got the race car washed but I ended up getting more water on me and the dogs than the car. We planned on leaving the house early to beat the projected 100+ degree heat but details slowed us and we didn't get on the road until after 12pm. The drive should take about 4 1/2 hours which will get us there about the time they open the gates at 5pm. Kim and I really enjoy long drives together and this one was no exception. Great conversation, great company, and plenty to see along the way made for a pleasant trip. Traffic got heavier as we got closer to the coast, and thankfully the temperature was dropping dramatically! We left home at 104 degrees and hit 61 when we saw the ocean. We pulled up to the state park gate a few minutes before 5 and the wait began. It wasn't boring however as everybody was excited to be there. NASA doesn't run Laguna often plus this was also a Northern/Southern Cal crossover event so there were lots of new faces and people to meet. At 6 we were allowed to line up to get in the paddock but the queue was long!! Everybody behaved and the line moved slowly but steadily. We got our paddock set up, had dinner and then Charlie Buzzetti snuck us on the track for a track walk to help familiarize us Laguna rookies with the nuances you can't get from a video game. Charlie's got a lot of laps here and his insights were very helpful and appreciated but now I'm nervous! This track looks tough and a mistake can be costly! Am I up for the challenge? A show of hands at the morning drivers meeting showed that over half the drivers had never been to this track so I didn't feel so nervous. We will all be learning together. Fourteen spec 944's lined up on the grid for morning warmup. Some faces and cars were familiar to me but others were not. As we headed out on track I was thinking that I didn't want to mess up anybody's session while learning the track, and I also wanted to hook up with Jim Richmond or Tom Atteberry, who both graciously said they would let me follow them while getting my feet wet. A group of us stayed together for a few laps but when I felt more comfortable I got some track space of my own and tested the limits. I turned a time of 1:51 which was good for fourth fastest but I knew others would be picking it up for qualifying. A fast time at this track is in the mid to high 1:40's. As predicted times dropped dramatically for qualifying with Norm Hamden snagging pole followed by Charlie. I got fifth behind Steve Lewis and Jim Foxx. Behind me the gap was nowhere near as big as warmups with just a second separating most of us. Ken Meyers and Jim Richmond, two very good racers(well, everybody in this field are very good!) with experience at this track were starting right next to or behind me so I had to get a good start. Didn't happen! I timed it wrong and Jim R got it right and pulled alongside me going into 1. I tried to give him room but didn't have much myself because Ken was inside and pulling away! Jim had to hit the dirt as I squeezed him out. I hated to do that to him but I didn't have any room myself. Ken and I funneled into turn 2 side by side with Jim R pressuring us hard! Directly in front of us Jim Foxx went off and came back on in front of me. I was sure I'd hit him so lifted(ARRGGG!!!) and Jim R took full advantage and got alongside as Ken and Jim Foxx pulled a gap. Into 3 Jim R got sideways and that's all I needed. I pulled some space and set sail for the two in front of me. When they went side by side through turn 4 I got a good run, passed Ken but couldn't clear Jim Foxx. Jim R cleared Ken because of mechanical issues and we settled into that order. I chased Jim Foxx and Steve Lewis as they battled. I couldn't catch them so just waited. Sure enough, Jim Foxx went off and hit the wall damaging the car. I tried catching Steve but couldn't. Late in the race my car started oversteering real bad, and Jim R was turning fast laps and catching up quickly. Luckily he ran out of laps and I finished fourth out of fourteen. Not bad. Sitting in impound it occurred to me that I'm in the company of some of the best in the country and felt very honored and proud of how far Kim and I have come. My moment of revelry was short lived however when iI rolled up to the scales. With the cool weather I didn't have my Coolshirt box full. I filled it full of gas to make up for it but did I do enough? I sat for a long time on the scales getting weird looks from the tech guy. He asked me how much minimum weight was supposed to be and gave me a look when I told him. 2603! Way too close for comfort. I'll add more ballast when I get home. Dinner was great. Kim and I couldn't wait for the planned potluck so we snagged some ribs from the NASA bbq but still ate with the group later. Charlie won, Norm second, Steve third. Just missed a podium but still a great day!! Good nights sleep because we were exhausted. Warmup and qualifying the oversteer got worse. I couldn't break the 1:40's. Ran a best of 1:50.003. Along with the oversteer I now had a clunk in the rear to match the one up front. Steve asked how old my shocks were and I told him 6 years. He was shocked(no pun intended). He had 2 year old rears that we swapped in. The old ones were so worn out that they would compress way too easily but wouldn't rebound at all. That accounts for my bouncing sensation. I qualified 5th but we decided to invert the grid. I would start behind a bunch of cars that I only out qualified by tenths. Should be exciting! Kim made me a plate of tamales for lunch and I took one bite and, uh oh, I'm choking! The food feels caught in my throat and I feel like I can't breath. I've been through this before and know it should pass but I started to panic. I sent Kim to look for medical help and I just tried to stay calm. No can do! I feel it getting worse so I wander over to where everybody is hanging out and try to get their attention. I'm starting to pass out so I slump against Charlie's car as the Paramedics show up, with the NASA officials in tow. After being checked out the paramedics advise me to relax and skip the race. Good advice which I planned to follow but as race time approached I felt better. I asked if any body minded if I raced and I got best encouragement from my fellow 944er's. I will always be indebted to these guys, some of whom I've never met before for their understanding and help. If you're going to choke to death these are the guys to be with! Embarrassed, ashamed, still choking and still hungry I lined up for the start. The last 6 of us stayed in line for one lap to let the frontrunners settle things and not cause a huge melee. After that it was on! Jim Foxx got in front of me and we started working our way through some tough drivers. Slowly I caught up to guys and gave everything I had to race cleanly and get by. I had great battles with a bunch of guys with memorable moments like when Everett Delano had an epic slide through the dirt right in front of me. I marveled at his car control skills and wondered whether I could have saved that one. Probably not. I couldn't dally too long admiring him because I had to get going. I eventually got up to second behind Jim Foxx but Charlie and Norm were coming. I pushed as hard as I could to hold them off but they are the best in the business! Both eventually got by but couldn't catch Jim. Now I had to watch my mirrors for Steve. He went off early in turn 11 but I knew he was coming fast. Late in the race I got a glimpse of him in the mirror so knew all I had to do was manage the gap. The "new" shocks made me understeer like a dump truck but it was enough to finish 4th again behind Jim Foxx ,Charlie and Norm. No drama at the scales this time, 2623 with the coolshirt. Weekends like this are why I race. A new,challenging track, new friends, old acquaintances and good racing. We should do more inverted starts, it's great fun! I need to thank everybody for the hospitality and understanding after my incident. I especially need to thank Everett, who as series director could have stopped me from racing but instead was very encouraging and understanding. I also want to say I think I've made new friends I look forward to seeing at Nationals like Jim Hicks, Jeff Wojnar, Norm Hamden, Everett Delano, and I always enjoy the old friends like Charlie Buzzetti, Ken Meyers, Jim Foxx, L'il Kat, Jerry Whitteridge, Steve Lewis, Jim Richmond, Tom Atteberry, and Aubie Schmidt. Stuck in sunday traffic dreaming about Miller and a national championship! 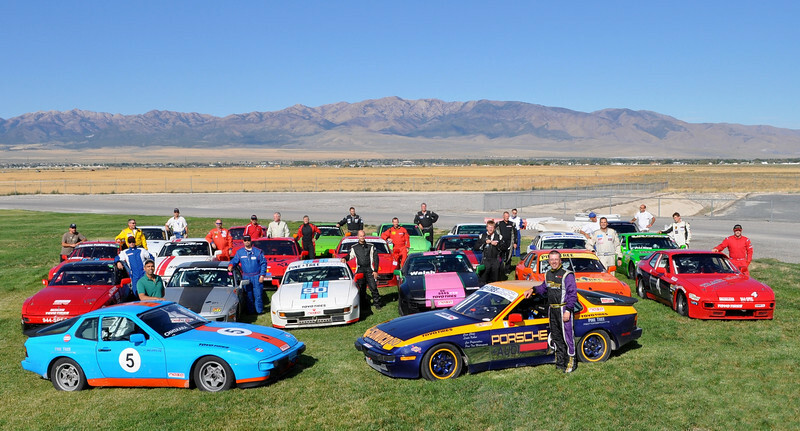 NASA’s Midwest and Great Lakes Regions hosted Round 2 of the 944 Spec season at Putnam Park Road Course on May 17-19. This track is a favorite of many drivers, featuring beautiful scenery and a fast, flowing rhythm that is well suited to the Porsche 944’s balance and stability. Excellent weather and a deep field of talent this weekend made for exceptional racing. Man, oh man. Just… wow. Eric Kuhns took the pole for Race 1, followed by Dan Pina, Angel Blazquez, Ray Freundt, Sudhir Chhikara, Ward Herst, Brad Raum, Steve Brewster, Shannon McCue, and Rick Briggs. Kuhns held the lead over Pina through the opening turns, followed closely by Blazquez. The racing for 4th-10th was intense from the get go, as Chhikara slipped by Freundt for 4th at the start and Raum displaced Herst for 6th. One corner later Herst found himself in the grips of a surging McCue and Brewster fighting for 7th. This was lap one! As the race settled, three major battles emerged: Pina and Kuhns nose to tail exchanging the lead; Chhikara and Freundt nose to tail for 4th, with Raum only two car lengths behind; and new comer Herst, a Putnam rookie, quickly coming up to speed and stalking McCue for 7th. After several attempts, Pina made his move around Kuhns in lap 7. Five laps later, Kuhns took the lead back in traffic. Pina wasn’t having it. After testing Kuhns in turns 7 and 8 multiple times, Pina used traffic to his advantage to take back the lead for keeps six laps later. At the flag, Pina had drawn out a 2.7 second lead, but was piped by Kuhns for the lap record by 0.02 seconds. While Blazquez cruised drama free to 3rd, the battle for 4th absolutely raged, making the Kuhns/Pina exchange look like a Von Trapp family picnic. Chhikara held his own in 4th for 13 laps under a withering assault from Freundt, who was never more than a car length off his rear bumper. Chhikara simply would not make a mistake, and absent that, Freundt didn’t have a window to pass. Raum kept the heat on immediately behind. After 13 laps of intense study, Freundt made a masterful pass around the inside of the turn 8 carousel with just enough momentum to make it stick in turn 9. Chhikara hounded Freundt for several laps, but eventually a gap opened up as he focused his attention on fending off Raum to the flag, ultimately taking 5th by a 0.6 second margin. Herst, a veritable learning machine, finished 7th only 1.5 seconds behind Raum and Chhikara while closing the gap rapidly. He dispatched McCue with four laps remaining, quickly stretching a 12 second gap as he learned the track. Brewster and Briggs rounded out the order close behind. Qualifying times were ripping for Race 2. Kuhns earned the pole with a sub-lap record 1:21.6, followed closely by Agran and Pina. Chhikara, Blazquez, and Freundt qualified within 0.5 seconds, followed by McCue and Raum (within 0.2 seconds) and Brewster and Briggs. Following qualifying, Pine Tree Motorsports and McCann Racing jumped in to make a quick transmission switch for Brewster and to address a linkage issue for Raum so both could make the afternoon race in perfect form. At the start, Kuhns’ hopes came to fruition as he gleefully watched Agran and Pina engage in a nose to tail battle for 2nd while he opened up a small gap. Behind the dueling pair, Blazquez moved inside Chhikara in the opening turns to take 4th, igniting yet another race long nose to tail battle. While neither of these battles produced a pass, the racing was ferocious – no mistakes, no opportunities, just endless nose to tail running through traffic at full speed. At the flag, Kuhns took the victory with a 3 second lead, while Agran held off a charging Pina at the line by 0.1 second. Blazquez took 4th over Chhikara by a second, followed by McCue, Brewster, and Briggs within sight. Raum retired with a flat tire due to a leaking valve stem in lap 4 and Freundt retired with play developing in his front suspension in lap 3. 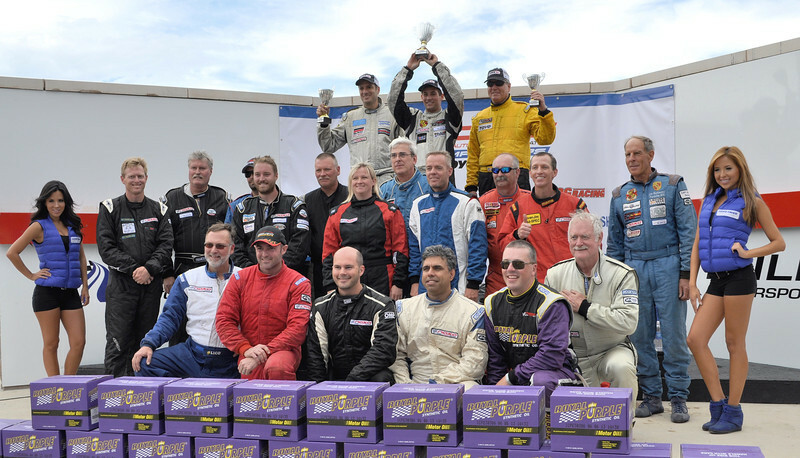 Several 944 Spec drivers contested round 2 of the 2013 Midwest Endurance Challenge on Friday afternoon. Agran teamed with Kuhns in his #80 car for the three hour event, while Herst teamed with Sam Grant in his #51 car. Chhikara, Brewster, Blazquez, and Briggs ran the 90 minute enduro as a test and tune session. The race was immediately preceded by an hour thunderstorm, leaving the track slippery and covered with significant areas of standing water and runoff. Herst, never having seen the course, started in 5th, with Agran beside him in 6th. The pair worked their way through traffic in the early laps, eventually rising to 4th and 2nd, respectively. Agran and Kuhns were sidelined by an unplanned stop on lap 50 to inspect the car after minor contact with a spinning backmarker (fortunately, no damage to that beautiful paint job! ), followed by a 5 minute fuel spill penalty. Herst and Grant climbed to 3rd, only to be felled by falling oil pressure at hour 2. Kuhns assumed 3rd from Grant and held it to the checker. Besides having an outstanding time, Midwest and Great Lakes 944 Spec drivers took home over $1500 in TOYO, HAWK, and BFG contingency dollars this weekend. A special thanks is due to Jim and Kelby Hartman of Pine Tree Motorsports, who again offered technical support to all competitors during the event. NASA’s Midwest Region 944 Spec season opened to frigid temperatures and the occasional flurry at Autobahn Country Club on April 19-21. As always, the racing was exceptional. Eric Kuhns took the pole for the first race of the season in his vintage Sunoco liveried car. Neal Agran earned the outside front row, followed by Sam Grant, Angel Blazquez, Sid Chhikara, and Dan Pina. At the start, Kuhns held the lead over Agran as Pina began a rapid surge to third. However, Pina ran wide at the exit of turn 5 in lap 3 while on Agran’s bumper and after a long journey across the wet grass found himself trapped in the mud. As the race progressed, Grant and Blazquez engaged in a tight battle for third amidst occasional snow flurries. Kuhns took the win at the flag with a new lap record of 1:39.0, followed closely by Agran, Grant, and Blazquez (separated by 0.4 seconds!). Chhikara retired midway through with a leaking oil cooler. Action photos courtesy of Noah Kuehmichel – check out the new liveries for 2013! Agran earned the pole for Race 2 in a wild, two lap qualifying session, followed by Kuhns, Grant, Blazquez, and Pina. Kuhns assumed the lead at the start from the outside in the turn 1-2 complex, followed by Agran, Grant, Blazquez, and Pina through turn 3. While Agran and Kuhns stretched out a gap, an outstanding 3-way battle for 3rd raged throughout the race. When the dust cleared, Grant, Blazquez, and Pina had each held the position. Kuhns took the win, followed by Agran, Grant, Blazquez, and Pina (nipped for 4th by 0.2 seconds). Pina was subsequently DQ’d for being underweight. Several 944 Spec drivers contested the first round of the 2013 Midwest Endurance Challenge in slippery conditions on Friday afternoon. Ray Freundt, Grant, and Blazquez each ran the event as a 90 minute test and tune, while Agran and Kuhns teamed up again in Kuhns’ #80 car to make a run at a repeat E3 series championship. The race opened to standing water and occasional flurries, switching over to wet conditions and steady sleet at the midpoint. Agran and Kuhns kept a steady pace and stayed out of trouble in the treacherous conditions, earning a surprise overall win. The Kaplan Racing E3 Miata gave chase throughout the event, but came up second overall, followed in third by the E0 Team Sarsfield Mustang. Sam Grant deserves special mention for capturing the fastest E3 lap of the race. Besides having an outstanding time, Midwest 944 Spec drivers took home over $1300 in TOYO, HAWK, and BFG contingency dollars this weekend. A special thanks is due to Jim and Kelby Hartman of Pine Tree Motorsports, who again offered technical support to all competitors during the event. Round 2 will take place at Putnam Park Road Course on May 17-19. A field of 13 is already registered and should make for an epic weekend. If you’ve read this far and you’re not racing with us… why not? We’d love to have you out to an event and give you a ride, let you take a test drive, and get you involved. We believe 944 Spec is the best way to get racing fast and to get faster. Take us up on the offer to try it and find out! !